ROGERS, Ark. – The World Trade Center Arkansas has played an active role in the past three months representing the state and its businesses during the ongoing process of modernizing the North American Free Trade Agreement. Melvin Torres, director of Western hemisphere trade for the World Trade Center Arkansas, traveled to Washington, D.C., from May 15-18 with several Arkansas leaders who were present for trade advocacy and support. These included Arkansas Secretary of State Mark Martin and Angela Marshall-Hofmann, member of the World Trade Center Arkansas Board of Advisors, who also served as former trade counsel for the U.S. Senate Finance Committee and has extensive experience in negotiation and congressional passage of trade agreements. The delegation met with multiple high-level government officials including the International Trade Administration, the U.S. Department of Commerce and members of the Office of the U.S. Trade Representative, among others. “NAFTA has been extremely beneficial to Arkansas,” Torres said. “We are in a unique position compared to other states of the nation as we export twice as much as we import with both partners. “The trade agreement has enabled Canada and Mexico to become our largest trading partners. It currently supports nearly 110,000 Arkansas jobs.” The USTR reports that U.S. jobs supported by goods exports pay up to 18 percent more than the national average. This unique position Torres refers to is the fact that Arkansas is one the few states in the United States that has a positive trade balance with both Canada and Mexico. After the group from Arkansas presented this information to the USTR, the World Trade Center Arkansas was referred to as the success example of Middle America during the policy discussions. During this mission to Washington, D.C., Torres and World Trade Center President and CEO Dan Hendrix also attended a conference with the State International Development Organizations. At the conference, they heard Secretary of Commerce Wilbur Ross present President Donald Trump’s trade agenda. Later, the group met with the Ambassador of Mexico, Geronimo Gutierrez, and the Embassy of Canada’s Deputy Chief of Mission. After returning to Arkansas, the WTCA partnered with the Arkansas District Export Council to create a survey assessing the needs of Arkansas companies in the context of NAFTA. Marshall-Hofmann was instrumental in creating the survey to best capture the needs of Arkansas companies. Secretary of State Martin then helped the center send the survey to more than 50,000 Arkansas companies. The center submitted a testimony on behalf of more than 150 Arkansas companies on June 15 to the USTR using the data from the survey. After compiling this data from the survey, the USTR invited the World Trade Center Arkansas back to Washington to testify on June 27 in the public hearing on federal government efforts to modernize NAFTA. Marshall-Hoffman and Torres crafted a testimony that simultaneously expressed the needs of Arkansas companies while emphasizing that Arkansas is a NAFTA success story for Middle America. Torres returned to Washington, D.C., on June 27 to testify on NAFTA, where he presented the needs of Arkansas companies and explained how NAFTA has largely benefited the state’s economy. 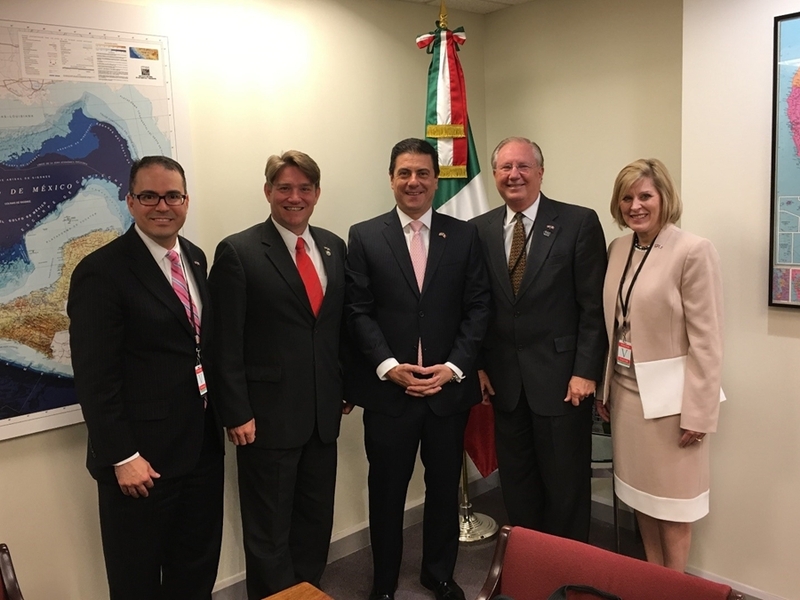 Torres then went to Dallas from July 10-12 to meet with officials at the Consulate General of Canada, the Consulate General of Mexico and ProMexico, a subdivision of Mexico’s Secretariat of the Economy, as part of the ongoing process to modernize the agreement. About the World Trade Center Arkansas: The mission of the World Trade Center Arkansas is to grow trade and increase Arkansas exports by connecting Arkansas businesses to the world through international trade services. The Center fulfills the University of Arkansas’ land grant mission to serve the state as a resource and a catalyst. For more information and valuable updates, please follow the Center on Facebook and Twitter, or subscribe to the World Trade Center Arkansas newsletter.